Predators is the third installment in the Predator movie franchise that began with 1987's Predator and continued with 1990's Predator 2. 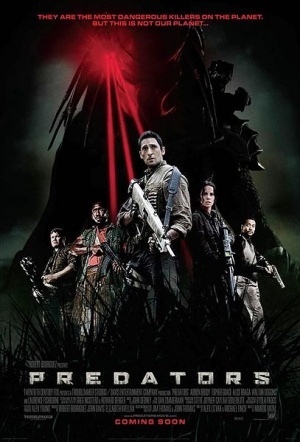 The 2010 sequel stars Adrien Brody as Royce, a mercenary who finds himself stranded on a strange planet along with seven other human 'predators'. The film was directed by Nimród Antal (Armored) and was produced by Robert Rodriguez. See the Discussion section for behind the scenes images from the film. 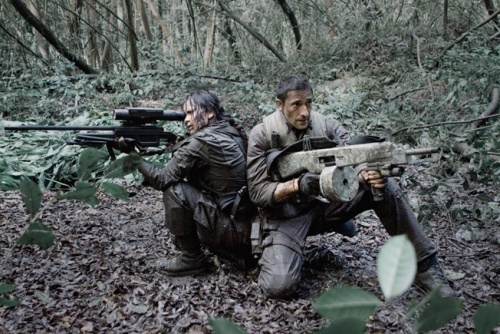 Royce (Adrien Brody) carries an AA-12 automatic 12 gauge shotgun throughout the movie. The shotgun is fitted with a drum magazine loaded with Frag-12 rounds, and fitted with a Surefire M910A weaponlight foregrip. It is also covered in a skin-like camouflage tape, which closely resembles that of the US Army's pixelized UCP pattern. 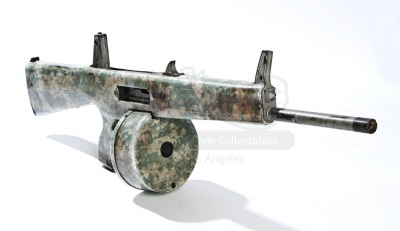 Screen-used stunt AA-12 from Predators. Note the missing sling, M910A and mount. Image from Prop Store of London. Opposite side view of the stunt AA-12 from Predators. Note the marks left by the sling. Image from Prop Store of London. 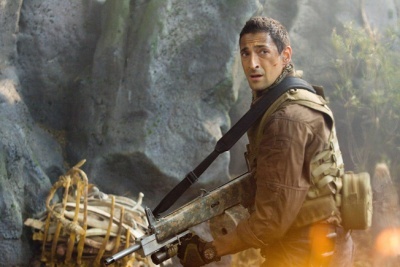 Adrien Brody as Royce with his AA-12 in a promotional image. Located on his back is what appears to be a drum magazine Pouch for his AA12. In this shot we can see the Surefire M900 weaponlight. 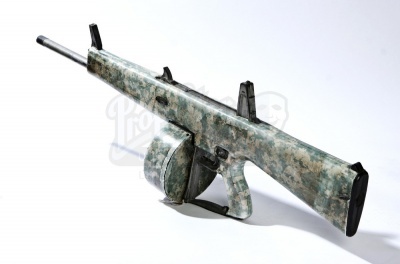 At this angle, the "custom camo paint" on his AA-12 appears to be UCP CAMO Form carefully wrapped around the weapon. You can see how the form creates sharp angles and is also peeling a bit around the ejection port. Also, the form creases down a bit where the rounded edges should be on either side. "This planet is a game preserve.. and we're the game." Royce holds his AA-12 Shotgun as Stans (Walton Goggins) rests against a tree. In the center, Royce holds his AA-12 as he and the others encounter a strange occurrence. Royce in the center with his AA-12. Royce wields his AA-12 while Isabelle aims her Blaser rifle. Royce holds his shotgun at the incoming Predator hounds. Royce and Nikolai let loose at the incoming Predator hounds. 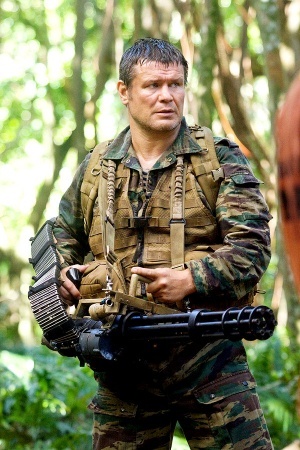 Nikolai (Oleg Taktarov), a member of the Spetsnaz Alpha Group carries a hand-held M134 Minigun substituting for a GShG-7.62, or a Slostin machine gun that is described in the script, reminiscent of the gun used by Jesse Ventura in the original film. When Nikolai first uses the Minigun a stoppage occurs. Nikolai is forced to fix the jam and reload the weapon. Nikolai later uses the Minigun to slay two Predator hounds and to lay down suppressing fire on Predators before the gun is destroyed in battle by a well aimed shot from a Predator Plasmacaster. During a lot of the firing scenes the barrels appear as if they are stationary. Likely the weapon had a fire rate very close to the film frame rate making the barrels appear to not rotate. During the non-firing scenes, Taktarov carries a very obviously non-firing replica. The most obvious telltale sign is that there is no central shaft attaching the four barrel clamp discs on the non-firing prop. Interesting to note about this film is that the Minigun's power supply appears to be stored in the actor's backpack. There is a brief scene in the Predator camp where the actor fires the gun while walking and the power cables can be seen leading from the gun and into the backpack. 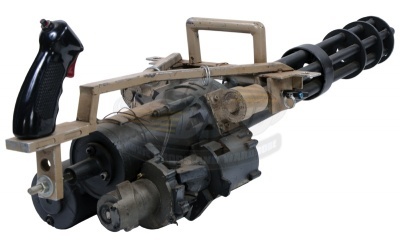 Screen-used stunt (static, made of metal, rubber, and plastic) hand-held M134 Minigun from Predators. Image from ScreenUsed.com. Opposite side view of the stunt M134 from Predators. Image from ScreenUsed.com. 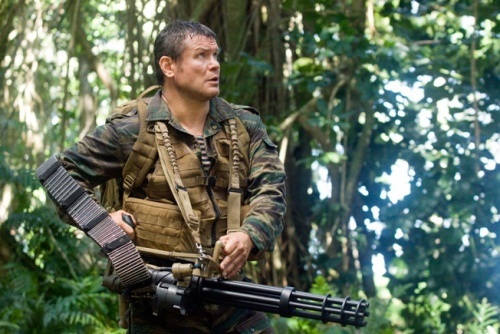 Promotional image of Oleg Taktarov as Nikolai with an M134 Hand held Minigun prop. Note that the prop is missing the central shaft on the barrel clamp that normally runs through the four discs. A publicity still of Nikolai and the prop M134 minigun. Nikolai with his GE M134 Minigun prop. Closeup of the minigun firing. During this scene, the barrels appear as if they are stationary. It's possible that the minigun's rate of fire was very close to the film frame rate making the barrels appear to not rotate (typically, the fire rate of a minigun is adjusted to be slower because of this problem). On the near left, Nikolai holds the minigun. Nikolai and Royce let loose at the incoming Predator hounds. Nikolai investigates the dead soldier's notes as his Minigun rests on his lap. Nikolai fires at the Predators. 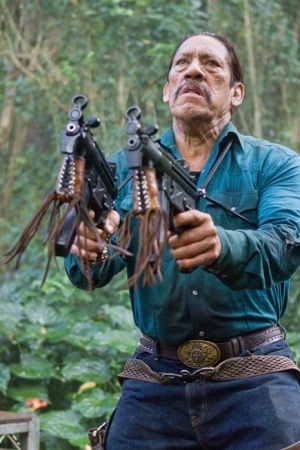 Cuchillo (Danny Trejo), a Mexican Drug Cartel enforcer, carries two Heckler & Koch MP5Ks fitted with braided leather covers on the foregrips and leather straps attached to the rear sling swivels and then slung over his shoulders, in a manner similar to Chuck Norris' Micro Uzi harness in Invasion U.S.A..
Cuchillo (Danny Trejo) with his MP5Ks in a promotional image. Note the custom covers on the foregrips and the shoulder rigs like Alice's from Resident Evil: Apocalypse. Cuchillo prepares to fire his MP5Ks at the Predator hounds. Cuchillo turns his MP5Ks on Stans (Walton Goggins), who asks the group for a gun. 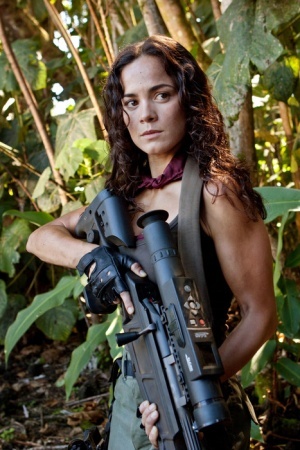 Isabelle (Alice Braga), an IDF sniper, carries a Blaser R93 Sniper Rifle fitted with an Elcan DigitalHunter scope (replacing the Heckler & Koch PSG1 described in the script). In several scenes, we hear the scope adjusting even though she isn't hitting any of the buttons. Note: this is due to an auto-focus feature on the scope, not an error in the movie. Isabelle uses this weapon to take down Predator hounds and uses it to wound a Predator near the film's finale. She also attempts to take down another hunted alien but after what appears to be a great shot at a fast moving target, she notes that she actually missed. Alice Braga as Isabelle in a production still with her Blaser L93 LRS2 fitted with an Elcan digital Hunter Scope. In a production still, Royce and Isabelle face back to back with their weapons. Isabelle with her Blaser R93 sniper rifle. Isabelle aims her Blaser as Royce wields his AA-12. Sideview of the Isabelle's Blaser. Isabelle takes aim at a Predator hound. 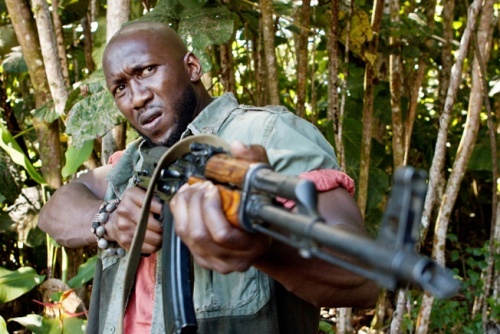 Mombasa (Mahershalalhashbaz Ali), a member of an RUF death squad, carries an AKMS rifle with the stock folded up throughout the movie. He once uses it to save Stans from an attacking Predator Hound when they first encounter them. Mombasa (Mahershalalhashbaz Ali) aims his AKMS in a publicity still. Mombasa opens fire with the AKMS on a Predator hound. 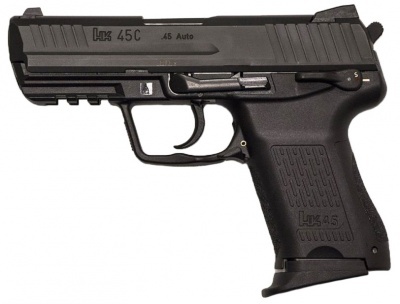 Isabelle (Alice Braga) carries a Heckler & Koch HK45C with a compensator attachment and a 10-round extended "elephant foot" magazine as her sidearm in the film. She carries it in a custom holster. She most notably uses it during the attack of the Predator hounds. Isabelle's compensated HK45C in the custom holster, as Royce saves her from falling into a pit. Isabelle fires her sidearm at an approaching Predator hound. Isabelle fires at the hound, to no avail. Isabelle turns her HK45C on her head to save herself from a painful death. Note the "elephant foot" magazine and the shorter barrel. Hanzo (Louis Ozawa Changchien) carries a customized Beretta 92FS Inox with ivory grips as his sidearm. The compensator was custom built by armorer Steve Karnes (AKA Phoenixent). The Yakuza assassin uses it until he acquires a katana from Noland's weapon cache. Promotional image of Louis Changchien as Hanzo with his custom Beretta. Note the teacupping grip. Hanzo draws his Beretta, showing good trigger discipline. Hanzo fires the Beretta at a Predator hound. Note the odd muzzle flash produced by the compensator. 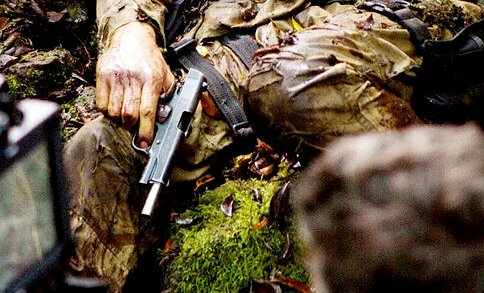 When the group stumble upon a dead American soldier (a comic prequel to the film published by Dark Horse reveals him to be a US Navy SEAL named Drake), he is grasping an empty M1911A1 with the slide locked back. Mombasa (Mahershalalhashbaz Ali) also uses a plain M1911A1 as his sidearm, and most notably uses it during the standoff between him and Stans (Walton Goggins). 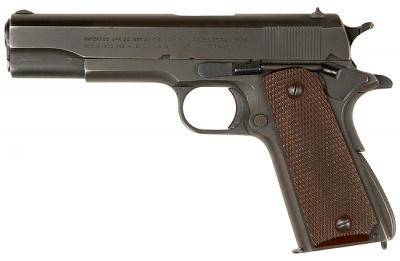 Behind the scene image showing a closeup of the M1911A1. (For the entire image, see the Discussion section. Nikolai investigates the dead soldier's notes as his Minigun rests on his lap. Note also the dead soldier's M1911A1. 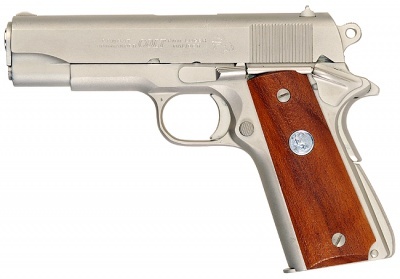 Mombasa holds his M1911A1 on Stans. Cuchillo (Danny Trejo) carries an heavily engraved, nickel plated Colt Commander as his sidearm. 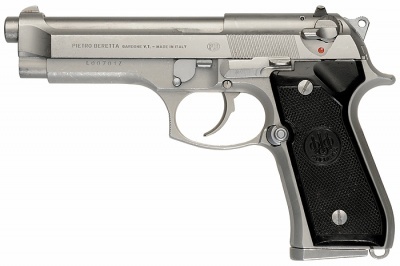 The gun also has golden parts which include the safety, slide release, plunger plug, trigger, hammer, and grip screws. 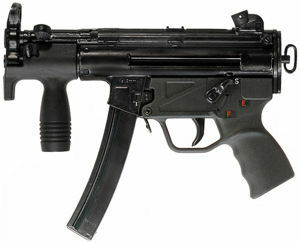 He is seen using it when his MP5Ks run empty during the attack of the Predator hounds. Cuchillo fires at the Predator hounds. Cuchillo fires his Colt Commander at the incoming Predator hounds. Royce (Adrien Brody) also uses a customized modern M1911 as his sidearm. Although, the weapon is not seen clear enough to determine the make and model, the gun has at least Novak sights, a beavertail grip safety, a combat hammer, and an M16-style flash suppressor (though the latter is not seen in the film). It has also been fitted with UCP-patterned tape on the grips. 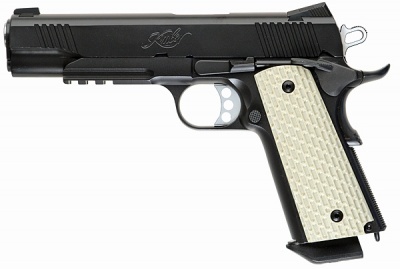 Kimber Warrior - .45 ACP. This looks very similar to the gun Royce uses. 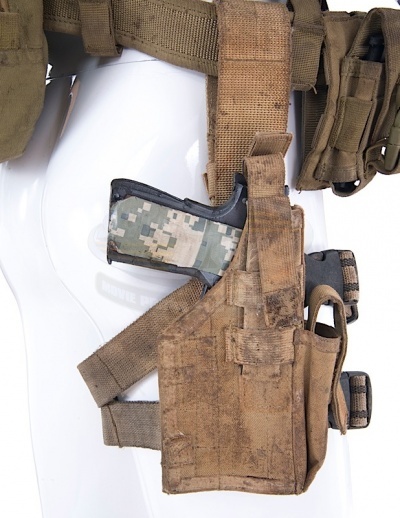 Royce's screen-used stunt (foam rubber) M1911 and holster from Predators. Image from ScreenUsed.com. Note the prop is a standard M1911A1 with UCP-patterned tape on the grips as opposed to the more modern 1911 Royce actually uses. As Royce holds his AA-12, we get a glimpse of his sidearm. 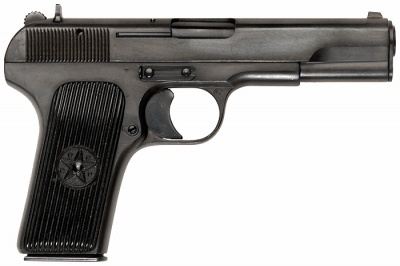 Nikolai (Oleg Taktarov) carries a Tokarev TT-33 as his sidearm in the film. After his Minigun is destroyed by one of the Predators, he switches to his sidearm. He fires it at a Predator in Noland's hideout when he goes back to save Edwin. 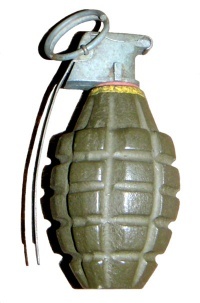 Several Mk 2 hand grenades are seen among the weapons in Noland's (Laurence Fishburne) arsenal. Royce (Adrien Brody) later strings several of them together in a trap for the 'Berserker' Predator. A table in Noland's lair with assorted weapons on it including Mk 2 grenades and a flare gun. When Nikolai (Oleg Taktarov) sees Noland's weapons cache, he eyes a M18A1 Claymore anti-personnel mine on the table. 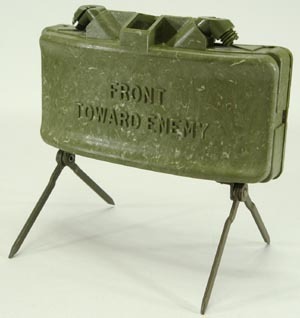 Nikolai apparently grabbed the Claymore mine offscreen, because he is seen using it prominently later. 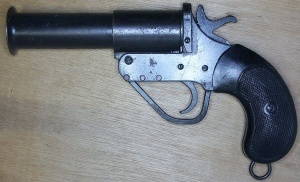 A Webley No.1 Mk. V Signal Pistol fitted with a custom barrel shroud is also seen in Noland's weapon cache. Royce (Adrien Brody) takes and uses the flare gun later on in the film. The flare gun rests on the table. Royce fires the flare gun. When the group are taken to Noland's (Laurence Fishburne) cave, they see he's collected a mixture of weapons, some human and some alien. 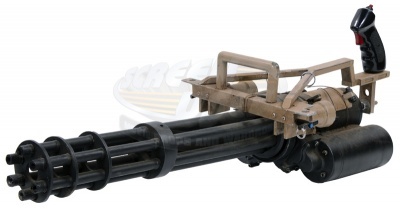 There's also a 26.5mm flare launcher which is used later in the film. Noland (Laurence Fishburne) shows up with an alien rifle. A table with assorted weapons on it. As Hanzo finds the Katana, a Mossberg-type shotgun is seen in the background.